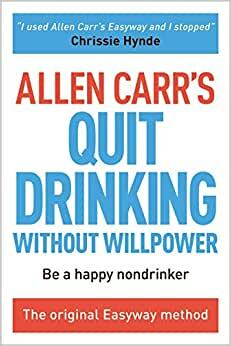 "I know so many people who turned their lives around after reading Allen Carr's books." To be clear, I have nothing invested in whether you buy or read this book other than the desire to share with the world the freedom that I now feel from no longer requiring nor desiring alcohol in my life. You think it’s going to be hard, that you will feel deprived, well something just clicked for me while reading this book. Without thinking about it, after 22+ years of drinking every night, I just decided to stop. I have absolutely no desire to take another drink. Yes, there is a little anxiety around stopping because it was so much a part of my life, but now I'm looking forward to seeing what like will be like without being a slave to alcohol. I felt powerless to quit for so many reasons all the while knowing I needed to. The constant battle with drink is exhausting. Every attempt to "control" my drinking just turned into a constant battle of how much and when and how often. I was consumed with thinking about drinking 24/7 and stuck and utterly powerless to do anything about it. I didn't want to do it anymore but I really did feel powerless to stop. Why did I keep doing the same thing? A chain smoking friend of mine suddenly dropped her ciggs like a hot rock after reading Allen's Easyway to Quit Smoking, I thought there might be something to this. While browsing the Easyway to quit smoking I came across this title. I've known for a while that I couldn't go on the way I have been, enough was enough, but how would I stop. There is something to be said about the moment you find clarity, when it's revealed to you that you are a rat in a maze and the maze is the booze and I have been running around like a rat since the first time I tasted it. None of my friends or family know the degree of the struggle that I have gone through. I've even been able to hide it from those closest to me and that too has been exhausting. But I no longer have to worry about any of it, because I made a choice not to drink. The book just has a way of getting you to this place. It's not too good to be true. I read the reviews and though the same thing. "Yeah, right.. How could this be true?" If you read this book with an open mind and at least somewhat sober and truly take in what it is saying, you can't help but see the truth behind all of the lies alcohol has been telling you for years. I don't know about you but I don't like being lied to. Now I am left to find fulfillment in the "real world" instead of the dead end at the bottom of a bottle. Wishing you all the best. Have been a heavy everyday drinker for well over 10 years and have not had a drink since I finished this book. It does not require any belief in hocus pocus like other programs, nor an admission that you are an irreversibly flawed person. This book simply reasons you out of your dependence by showing you that you are not actually getting any pleasure out of alcohol, at least not the kind that you believe you will get when you are itching for a drink. Drinking only stops the withdrawals. It does not help you relax. It does not help you forget your problems. To test this for yourself, have a few drinks and truly try to feel these positive benefits for yourself. If you are like me, you will see that alcohol has not relieved you of any of your worries, only fixed your withdrawals for a short time period. You only believe alcohol helps you in these ways when you want to drink, but it's just an illusion. Once you see this idea clearly, it really is much easier to dismiss cravings for what they are; mild physiological withdrawal symptoms that will end soon if they are ignored. Highly recommend this book to anyone looking to rid themselves of alcohol, especially more secular thinkers that can't get into the spiritual aspect of 12-steps.